Get Your BC Racing Wheel HB 05S for Ford Vehicles at ModBargains! The BC Racing Wheels HB 05S are now available for Ford vehicles at ModBargains with GREAT PRICES, FAST SHIPPING, and QUICK DELIVERY TIMES! Give us a call to order at 714-582-3330. BC Racing Wheels' HB 05S is simply ground breaking. When you're looking for a wheel that is capable of being on a show car, on a race car, and most commonly on a daily driver, the BC Racing Wheels HB 05S will give you all the satisfaction you need. The one difference that this wheel has compared to most other high end wheels is value. And when you think of value, you think of compromises. But that's the difference, there are no compromises with any BC wheel model. This wheel is way lighter and stronger than any other wheel on the market for the same price, and the secret is in the CNC process that it goes through. 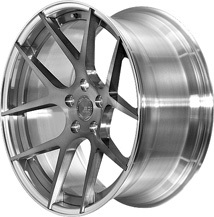 The BC Racing Wheels HB 05S is completely forged out of two pieces of T6061 aluminum. That allows BC to be as creative as they want to be; their innovation shows through the one-of-a-kind designs that come out of their factory. And what's great about he HB-S series wheels is that they are both extremely concave and have spokes that grab the very edge of the barrel. This gives the illusion of having a much bigger wheel diameter and a fuller face without sacrificing strength and weight. BC boasts in their functionality and adaptability. These wheels will do just about anything you want them to in any driving situation. If you don't believe it, BC has proven it. They have sponsored numerous drivers in the Formula Drift series, which is one of the most stressful and demanding sports for a cars rims and tires. BC is a huge name in the drift industry, and they should be because their drivers trust their products with doing the most crucial job in the sport, maintaining tire contact without flexing or breaking. So if a race car driver can depend on BC Racing Wheels, you can too! So if you have any questions or need help, our product experts here at ModBargains would love to talk to you! Just call 714-582-3330. The BC Racing Wheels HB 05S can come in just about any color or finish that your mind can imagine. The limitless customization you can apply to BC's wheels is what gives you car that unique look that distinguishes it from the rest. And with the help of one of our ModBargains product specialists you can order your dream wheel fitment and style in a matter of minutes. So if you're ready to grab a new set of the BC Racing Wheels HB 05S, give ModBargains a call at 714-582-3330. Buying your BC Racing Wheels HB 05S from ModBargains is an excellent decision. Our product experts will ensure that you order the right fitment and wheel for your car and answer any questions that you may have with ease. We also offer the best customer service in the business, and our delivery times for wheels are quick and easy for your convenience and happiness. We offer great prices on BC Racing Wheels. If you're looking to completely deck out your ride with a new look that's light and strong, grab a set of BC Racing Wheels HB 05S's at ModBargains!